i’ve been on a pasta making kick. why? because it’s easy! it’s really actually easy. time consuming? yes. hard? no way. 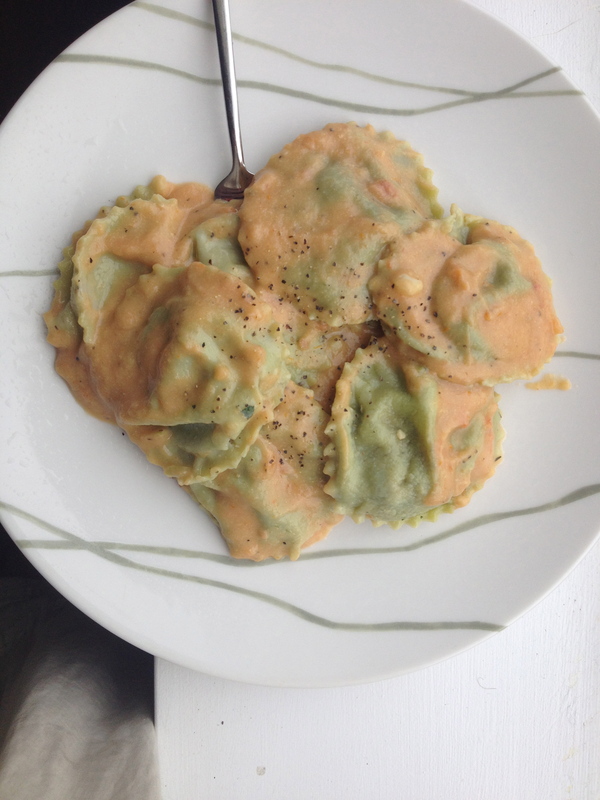 this ravioli dish was worth the time it takes. I used the same dough as i did for this recipe, but i juiced a 2 c. of loosely packed spinach and used it as part of the 1/2 c. liquid. 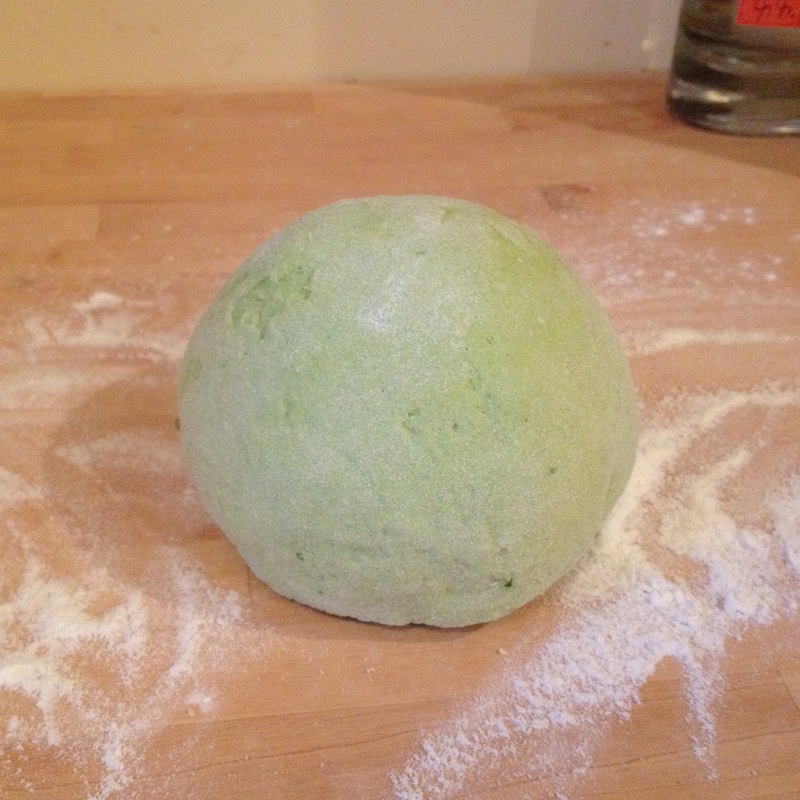 i came out with a beautiful pastel green dough, highly recommended. cut into 4 and roll it out into long thin pieces. you should be able to fit 2 rows of ravioli all the way down. dollop filling in rows of two down the sheets on 2 of the pieces (make sure to leave enough room to seal your raviolis). brush water around the filling then drape the unused sheets of pasta overtop and gently press around each one, making sure there’s no air trapped inside. cut with a ravioli cutter or a juice glass. get all the little scraps, ball em up and roll em out again and make more. check your edges and if they don’t seem sealed you can patch them up with a moistened thin piece of dough. it’s not the prettiest but it’s better than losing all your filling in the pot. 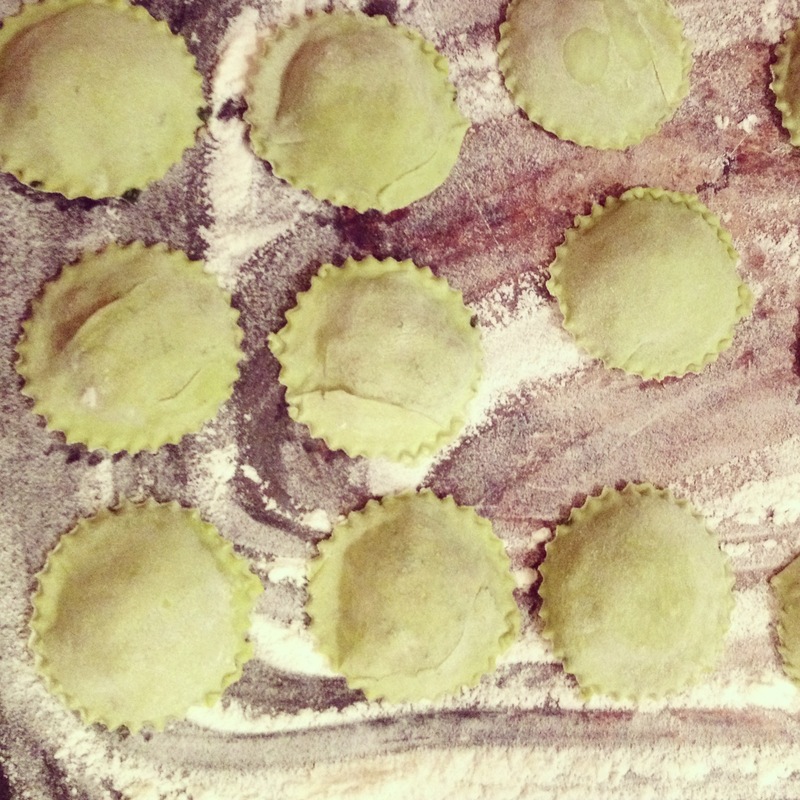 while you’re cutting the ravioli, put them on a floured baking sheet and cover with a tea towel. for me this made 35 3″ ravioli. saute mushrooms with garlic then put into the food processor, but keep the pan heated! through the broccoli in there and cook it up. add everything to the food processor and pulse it around until it’s pretty well chopped but not pureed. put aside! it’s done! well actually taste it and see how the seasoning is stacking up for your taste buds. bring the broth and milk and cauliflower to a boil then simmer until soft. then blend it all up! i put a couple sundried tomatoes in mine just to see what happened and it was damn tasty. roasted peppers would be good to, but also HEY if you keep it as is, it’s almost like an alfredo.